The new name means ‘Bears Ears’ in Navajo, but the five-tribe coalition that sought the monument had asked for an English name for the sake of unity. President Donald Trump not only trimmed and broke up the Bears Ears National Monument when he visited Utah last week. He also renamed it with the Navajo-language term for Bears Ears, a gesture that could be courting trouble with many Native Americans. 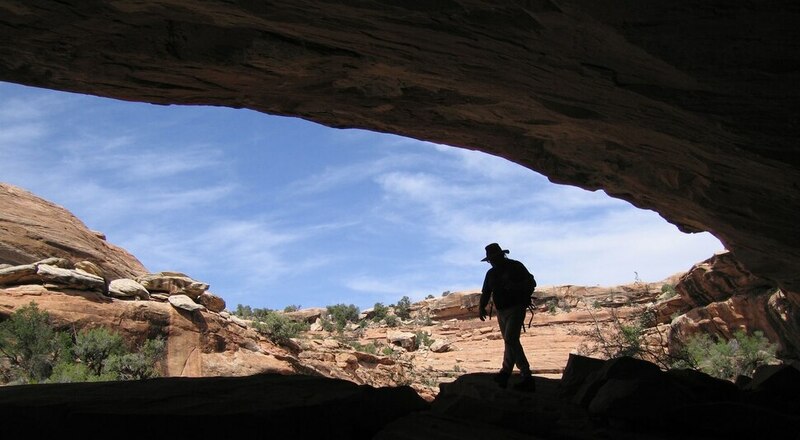 Officials in the Trump administration say renaming one of two new smaller monuments Shash Jaa reflects tribal spiritual and ancestral ties to that part of southern Utah’s San Juan County, where Bears Ears Buttes rise over the landscape like twin beacons. But according to Navajo Nation Attorney General Ethel Branch, who is leading the multiple tribe-backed lawsuit to halt the action, the Interior did not consult Navajo tribal officers about any aspect of Trump’s proclamation establishing a diminished and renamed monument. Nor did the Interior run anything past Utah Dine Bikeyah, the local grass-roots Navajo group deeply involved with the Bears Ears proposal, according to executive director Gavin Noyes, who views the rename as a cynical attempt to divide the tribes by exploiting historic grievances among them. Noyes’ group had initially suggested naming the ambitious land conservation proposal Dine Bikeyah, which means “the people’s homeland” in Navajo, but embraced the more inclusive name to gain support from the Ute, Ute Mountain Ute, Zuni and Hopi tribes. Five tribes eventually signed on and petitioned for the monument designation as sovereign entities. On Dec. 28, Obama named the short-lived monument Bears Ears in reference to the twin buttes visible from every direction that have served as a geographic reference point for thousands of years. The first sentence of his proclamation cited the various names for the buttes in the tribes’ languages: Hoon’Naqvut (Hopi), Kwiyagatu Nukavachi (Ute), Shash Jaa (Navajo) and Ansh An Lashokdiwe (Zuni). During his brief visit to Salt Lake City last week, Trump trimmed the monument to a fraction of its original size and carved out a second monument for Indian Creek. 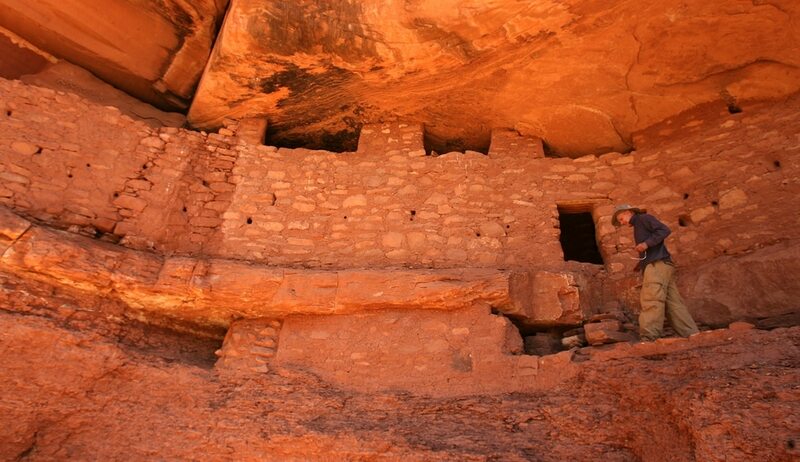 Together, the two add up to 202,000 acres, an 85 percent reduction of the original monument that left out Cedar Mesa and other critical landscapes rich in archaeological and natural values. (Steve Griffin | The Salt Lake Tribune) Air Force One prepares to land at Salt Lake City International Airport for President Trump's visit to Salt Lake City on Monday, Dec. 4, 2017. (Steve Griffin | The Salt Lake Tribune) Air Force One leaves the Salt Lake International Airport after President Trump visited Salt Lake City Monday December 4, 2017. (Steve Griffin | The Salt Lake Tribune) Air Force One lands at Salt Lake City International Airport as President Donald Trump visits Salt Lake City on Monday, Dec. 4, 2017. (Steve Griffin | The Salt Lake Tribune) Air Force One lands at Salt Lake City International Airport as President Donald Trump visits Salt Lake City on Monday, Dec. 4, 2017. (Scott Sommerdorf | The Salt Lake Tribune) The arrival of Air Force One at the Ronald R Wright National Air Guard Base, Monday, December 4, 2017. (Francisco Kjolseth | The Salt Lake Tribune) Interior Secretary Ryan Zinke is acknowledged by U.S. President Donald Trump on stage at the Utah Capitol on Monday, Dec. 4, 2017, moments before signing two presidential proclamation to shrink Bears Ears and Grand Staircase-Escalante national monuments. (Francisco Kjolseth | The Salt Lake Tribune) U.S. President Donald Trump is joined by Sen. Mike Lee at the Utah Capitol on Monday, Dec. 4, 2017, prior to signing a presidential proclamation to shrink Bears Ears and Grand Staircase-Escalante national monuments. (Francisco Kjolseth | The Salt Lake Tribune) Speaker of the House Greg Hughes, pumps his fist after being acknowledged by U.S. President Donald Trump at the Utah Capitol on Monday, Dec. 4, 2017. President Trump signed two presidential proclamation to shrink Bears Ears and Grand Staircase-Escalante national monuments. (Francisco Kjolseth | The Salt Lake Tribune) Rep. Mike Noel, R-Kanab delights in having his tie signed by U.S. President Donald Trump at the Utah Capitol on Monday, Dec. 4, 2017, following Trump's signing of two presidential proclamations to shrink Bears Ears and Grand Staircase-Escalante national monuments. (Scott Sommerdorf | The Salt Lake Tribune) The arrival of Air Force One at the Ronald R Wright National Air Guard Base, Monday, December 4, 2017. (Francisco Kjolseth | The Salt Lake Tribune) U.S. President Donald Trump is joined by Senator Orrin Hatch at the Utah Capitol on Monday, Dec. 4, 2017, to sign a presidential proclamation to shrink Bears Ears and Grand Staircase-Escalante national monuments. (Francisco Kjolseth | The Salt Lake Tribune) U.S. President Donald Trump is joined by Senator Orrin Hatch at the Utah Capitol on Monday, Dec. 4, 2017, to sign a presidential proclamation to shrink Bears Ears and Grand Staircase-Escalante national monuments. (Francisco Kjolseth | The Salt Lake Tribune) U.S. President Donald Trump is surrounded by Utah representatives at the Utah Capitol on Monday, Dec. 4, 2017, after signing two presidential proclamations to shrink Bears Ears and Grand Staircase-Escalante national monuments. (Francisco Kjolseth | The Salt Lake Tribune) U.S. President Donald Trump takes the stage at the Utah Capitol on Monday, Dec. 4, 2017, to sign a presidential proclamation to shrink Bears Ears and Grand Staircase-Escalante national monuments. (Scott Sommerdorf | The Salt Lake Tribune) he arrival of Air Force One at the Ronald R Wright National Air Guard Base, Monday, December 4, 2017. (Francisco Kjolseth | The Salt Lake Tribune) Bruce Adams, right, Chairman of the San Juan County Commission has his hat signed by U.S. President Donald Trump at the Utah Capitol on Monday, Dec. 4, 2017, following Trump's signing of two presidential proclamations to shrink Bears Ears and Grand Staircase-Escalante national monuments. (Francisco Kjolseth | The Salt Lake Tribune) U.S. President Donald Trump is surrounded by Utah representatives at the Utah Capitol on Monday, Dec. 4, 2017, as he signs a presidential proclamation to shrink Bears Ears and Grand Staircase-Escalante national monuments. (Scott Sommerdorf | The Salt Lake Tribune) President Trump visits with a crowd of admirers after he arrived in Salt Lake City, Monday, December 4, 2017. (Scott Sommerdorf | The Salt Lake Tribune) Senator Orrin Hatch visits with a crowd of Trump admirers after he arrived in Salt Lake City, Monday, December 4, 2017. (Scott Sommerdorf | The Salt Lake Tribune) President Trump visits with a crowd of admirers after he arrived in Salt Lake City, Monday, December 4, 2017. (Scott Sommerdorf | The Salt Lake Tribune) President Trump deplanes from Air Force One with Senators Hatch and Lee at the Ronald R Wright National Air Guard Base, Monday, December 4, 2017. (Scott Sommerdorf | The Salt Lake Tribune) Air Force One arrives at the Ronald R Wright National Air Guard Base, Monday, December 4, 2017. (Scott Sommerdorf | The Salt Lake Tribune) The arrival of Air Force One at the Ronald R Wright National Air Guard Base, Monday, December 4, 2017. (Scott Sommerdorf | The Salt Lake Tribune) President Trump deplanes from Air Force One with Senators Hatch and Lee at the Ronald R Wright National Air Guard Base, Monday, December 4, 2017. (Scott Sommerdorf | The Salt Lake Tribune) President Trump visits with a crowd of admirers after he arrived in Salt Lake City, Monday, December 4, 2017. (Scott Sommerdorf | The Salt Lake Tribune) Governor Gary Herbert and his wife, Speaker Greg Hughes and his wife, wait for President Trump to deplane after the arrival of Air Force One at the Ronald R Wright National Air Guard Base, Monday, December 4, 2017. (Scott Sommerdorf | The Salt Lake Tribune) he arrival of Air Force One at the Ronald R Wright National Air Guard Base, Monday, December 4, 2017. (Scott Sommerdorf | The Salt Lake Tribune) President Trump visits with a crowd of admirers after he arrived in Salt Lake City, Monday, December 4, 2017. (Scott Sommerdorf | The Salt Lake Tribune) Air Force One arrives at the Ronald R Wright National Air Guard Base, Monday, December 4, 2017. (Scott Sommerdorf | The Salt Lake Tribune) President Trump visits with a crowd of admirers after he arrived in Salt Lake City, Monday, December 4, 2017. (Scott Sommerdorf | The Salt Lake Tribune) President Trump arrives in Salt Lake City after the arrival of Air Force One at the Ronald R Wright National Air Guard Base, Monday, December 4, 2017. (Scott Sommerdorf | The Salt Lake Tribune) The arrival of Air Force One at the Ronald R Wright National Air Guard Base, Monday, December 4, 2017. (Scott Sommerdorf | The Salt Lake Tribune) President Trump arrives in Salt Lake City after the arrival of Air Force One at the Ronald R Wright National Air Guard Base, Monday, December 4, 2017. (Scott Sommerdorf | The Salt Lake Tribune) President Trump arrives with Senators Hatch and Lee, and Interior Sec. Zinke, after arrival of Air Force One at the Ronald R Wright National Air Guard Base, Monday, December 4, 2017. (Scott Sommerdorf | The Salt Lake Tribune) Governor Gary Herbert and his wife, Speaker Greg Hughes and his wife, wait for President Trump to deplane after the arrival of Air Force One at the Ronald R Wright National Air Guard Base, Monday, December 4, 2017. (Scott Sommerdorf | The Salt Lake Tribune) Two young boys dressed as Trump waited for the arrival of Air Force One at the Ronald R Wright National Air Guard Base, Monday, December 4, 2017. (Rick Egan | The Salt Lake Tribune) Perry Dixon, stands with his kids Miles, 6, and Parker 9, as they protest President Trump's visit to Utah to shrink the Bears Ears monument in front of the Utah State Capitol Building, Monday, December 4, 2017. In a speech at the Utah Capitol, the president said Utah’s national monument designations disenfranchise locals residents, including Native Americans, by keeping them from accessing these public lands. Some tribal officials scoffed at this claim, since it was elected Native American leaders who pushed for a Bears Ears monument. “It’s pretty obvious [Trump] thinks he’s going to divide us, but if anything, it has done the reverse,” said Shaun Chapoose, who serves on Ute Tribe’s business committee, on KUER’s RadioWest program last week. (AP Photo/Rick Bowmer) Shaun Chapoose, at a Dec. 4, 2017 news conference in Salt Lake City. 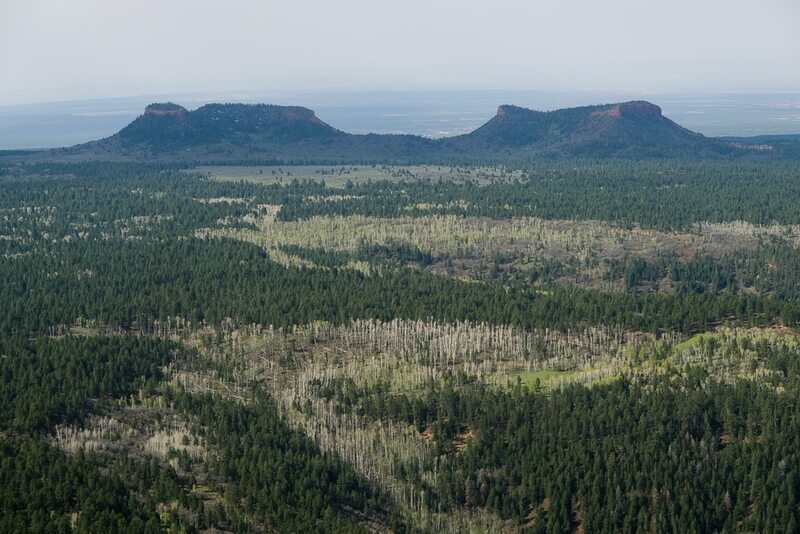 Obama’s Bear Ears proclamation also gave a special advisory role over monument management to a panel known as the Bears Ears Commission, comprised of one representative from each of the five tribes. The commission, which has met monthly since February, includes Chapoose and other tribal officials who are strong monument supporters. Trump now intends to insert an anti-monument member of the San Juan County Commission onto the panel. The proclamation he signed Monday renames it Shash Jaa Commission and excludes Indian Creek from its jurisdiction. It also requires the group include the county commissioner representing the Navajo-majority’s District 3, a seat currently held by Rebecca Benally, a monument opponent. In a separate case, a federal judge has ruled San Juan’s voting districts violate the Constitution because they are gerrymandered along racial lines. Native Americans make up a slight majority in San Juan County, but have never held a majority of seats on either the three-member county commission or five-member school board due to the illegal way voting districts are configured, the Navajo Nation has argued in court. U.S. District Judge Robert Shelby agreed and has ordered a redistricting that could soon result in two Native American-majority commission districts in San Juan County, including the one now held by Phil Lyman of Blanding. Trump’s proclamation on Monday also called on Congress to give the reconstituted Shash Jaa Commission “co-management” powers with federal agencies, but that gesture got little respect from Navajo tribe officials. They say Obama’s proclamation gave them as much influence over monument management as allowed under current law and that they were happy with that. — Tribune reporter Thomas Burr contributed to this report.